We had a neighbor boy named Ben. Ben was a seventeen-year-old high school dropout with blonde hair buzzed down to stubble. He liked smoking cigarettes and drinking beers with his buddies in the alley. We kept a close eye on Ben, but never felt too worried. He was polite and quiet and we generally liked him. That was, until, he attempted to grow marijuana on our garage roof and made me feel like Attorney General Eric Holder. I knew from firsthand experience that most crimes committed by a seventeen-year-old are of the boneheaded nature. I, myself, was arrested for loitering in my tiny hometown in Ohio when I was Ben’s age. I knew a thing or two about dumb crime. Which was what made this even more uncomfortable. On a recent Sunday, I called my mother to chat. Midway through our talk I told mom I had to go, something looked weird atop the garage. Keep in mind, our one-car garage was in the backyard, had a flat roof and was no more than eight-feet high. So, it was pretty obvious when there was a large green flower pot atop it. A flower pot we didn’t own. A flower pot we didn’t own and didn’t put there. My wife and I had been cautioned by a neighbor weeks earlier that Ben had been getting into backyards and acting suspicious. It took about three seconds to guess who had likely placed this plant life atop our shingles. We dug out the ladder, climbed the roof, and discovered this wasn’t a bouquet of daisies delivered to our roof by some FTD snafu. Inside our little gift pot was, well, the gift of pot. I’d never grown weed, but had seen enough Grateful Dead tapestries to get an idea of what we were dealing with. Frankly, I was a little jealous of our neighborhood Snoop Dogg. This kid was raising big, hearty, healthy-looking crops while I couldn’t grow decent cherry tomatoes to save my life. Some folks would have started cycling through brownie recipes before getting this little bundle down from the garage. But my wife and I had a tougher time deciding what to do. Should we have laughed or should we have been responsible taxpayers who call the police? The situation was not unlike the current battle between state and federal authorities on whether or not to criminalize pot that was recently legalized in Washington and Colorado. I consider myself open minded. If someone wants to grow weed, knock yourself out. Times are tough, we all need to get creative with money-making. But I had my hands full with a rotting crop of cherry tomatoes, so I didn’t really want my garage being used to rub my nose in someone else’s agricultural success. The repercussions were also clear. Our state, Kentucky, had not legalized marijuana last November like Colorado and Washington. If a passerby discovered this plant and phoned the police, we would have been in trouble. Everybody knows the old, “Honest, officer, I didn’t know there was marijuana growing on my roof,” defense hasn’t worked for decades. In the end, we decided we were far less hip than Eric Holder and the ongoing Phish concert we call the Justice Department. Instead of finding his bong and digging out a black light, the officer proceeded to call about six other cops and drug detectives to my yard. A quick tour of the back alley revealed two similar growing operations in an elderly neighbor’s bushes. Our street suddenly turned into the set of Weeds. Eventually, two detectives moseyed over to Ben’s house for what they called, “a knock-and-talk.” The teen, unfortunately, wasn’t home. 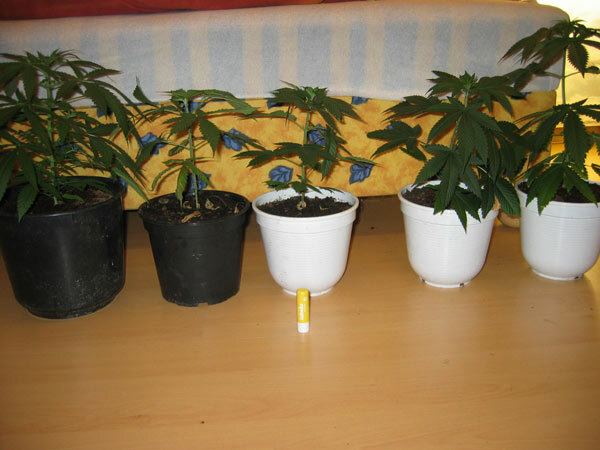 The police did, however, take a little tour of his house and uncovered a small cash crop growing in his bedroom. Apparently, my garage was this kid’s overstock department. At that point, the cops stopped updating us with the investigation. My assumption was that things weren’t going to end well for Ben. My first reaction was “good riddance” and I hope this kid gets in some serious trouble for dragging me into this mess. But then I felt guilty. No matter how misguided his world already was, I might have inadvertently screwed it even further. I hoped not. I’m a big believer in redemption and this kid’s life was just beginning. Ideally, Ben will soon grow up and probably get a job. And I hope he makes something good happen. Given his distaste for education and propensity for narcotics, he’s already on the fast-track to holding public office. As the weeks passed, Ben and his buddies continued to hang out in the alley, smoke and drink. Our garage roof was never again used as a greenhouse. Most likely, Ben got a juvenile slap on the wrist and realized he needed to be a little more clandestine about things. While this low-impact result would have angered many people, it felt like the perfect solution. My wife and I did the law abiding thing and Ben didn’t get in much, if any, trouble. Best of all, Ben likely has his entire life now to get on the right track and that makes me happy. Frankly, I want this kid to succeed in something other than converting my garage to a greenhouse. I hope he turns it around. Anything is possible. Take it from a guy who was arrested for simply standing: when you do something moronic, there’s nowhere to go but up. Or, maybe Kentucky will make life easier and just legalize pot.